LANSING — Poultry farmers increasingly raise chickens, turkeys, ducks and geese in environmentally greener and healthier habitats, according to the American Pastured Poultry Producers Association. “The concept is to provide good pastured poultry practices,” said Roy Ballard, a Purdue University Extension educator. Pastured poultry is raised in open fields rather than indoors. 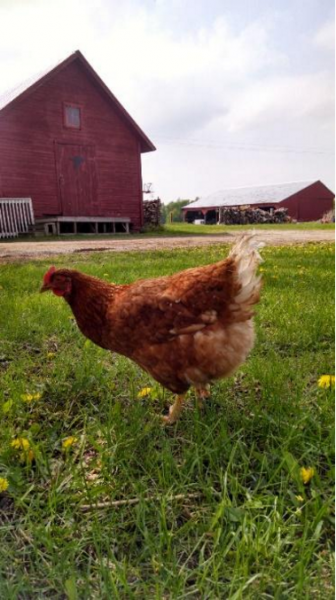 Carpenter, owner of Break O’Day Farm, raises both pastured and free range poultry. With pastured poultry, hens roam without fences, she said. Free range chickens roam in a fenced-in enclosure but have a coop to go into at night. 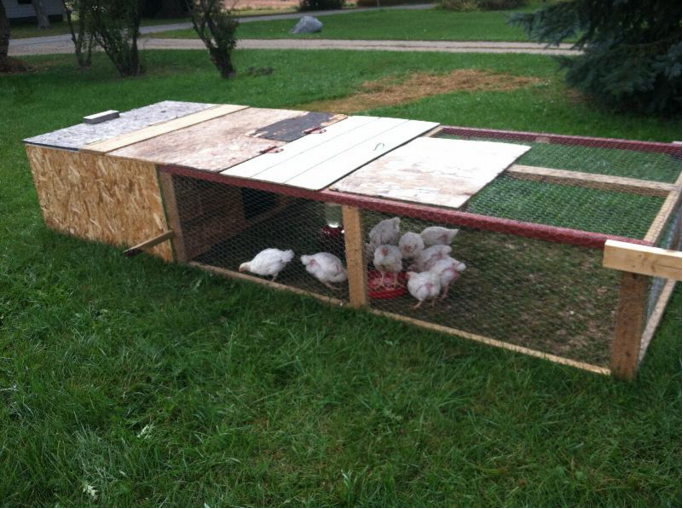 Her meat birds are raised with a portable shelter known as a Salatin-style chicken tractor. The shelter can move around the pasture so the birds are always on fresh grass, a key aspect of pastured poultry. “I put meat birds in the shelters because meat birds are stupid,” Carpenter said. The shelter protects the birds from predators. Her laying chickens are smarter and can fly into trees when predators approach. 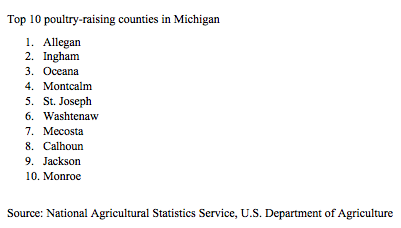 Top poultry-producing counties in Michigan include Allegan, Oceana, St. Joseph, Montcalm and Mecosta. Consumers increasingly demand local and healthier birds, according to Mike Badger, executive director of the poultry association. As evidence of the growing interest, his group has 1,100 members, up from 500 in 2013, Badger said. The organization focuses on farmers who want to make pastured poultry a profitable business. The Isa Brown breed is known for brown eggs. Image: Caitlin Carpenter. Purdue University’s Extension service is developing a marketing initiative for pastured poultry to boost interest. Advocates regard it as more sustainable and humane for the birds. Pastured poultry farming has been around for centuries. Large confinement facilities were created in the 1950s and most poultry in the United States are still raised in these factories, according to the poultry association. Joel Salatin, owner of Polyface Farm in Virginia, is credited with promoting the practice. He invented the Salatin tractor from tinkering with an unused portable rabbit run. It’s used to move chickens onto fresh grass while protecting them from predators. “Salatin basically started promoting pasture poultry,” said Kenneth Koelkebeck, a poultry specialist at the University of Illinois Extension. The Salatin system requires no specialized or expensive machinery, according to a Michigan State University report that refers to Salatin’s book, “You Can Farm.” Seed, fertilizers and fuel are also reduced when grass instead of grain is grown. Vet bills are lower and the birds are healthier, according to the report. A growing number of farmers have no interest in operating factory farms, according to the poultry association. Pastured poultry farms produce higher quality and farm-fresh products. “I choose pastured poultry for product quality, a good quality of life for the birds and land utilization,” said Andrew Larson, an Extension educator in local food systems and small farms at the University of Illinois. Larson’s programs teach farmers about business and marketing planning, backyard and small commercial poultry production, market strategy and sales and alternative crop and livestock production for small farms. Larson also runs a small free range farm with 600 hens in the summer and 300 in the winter. He practices both types of poultry production with a crossbred strain that are great egg layers, hardy and docile, he said. These characteristics make them good for free range production. Larson sells his eggs to local restaurants, retail stores and farmers markets. Larger pastured poultry farms often raise meat birds instead of eggs. With a large number of birds to be raised and processed, farmers have to find processing plants that will handle thousands of birds. For example, Paul Ehrhardt, owner of JenEhr Farms in Wisconsin, raises about 8,500 meat birds a year. He processes them in Minnesota because it has the closest processing facility that can handle that many. Kelly vanFrankenhuyzen writes for Great Lakes Echo. Purdue University marketing initiative: http://www.purdue.edu/newsroom/releases/2015/Q4/extension-developing-marketing-group-for-pastured-poultry-farmers.html. LANSING — It started with a blame game among government officials. Now, many people want to know whether the Flint water crisis was fueled by racism and classism.